The Val de Vie Estate lies in the Berg River Valley in the Western Cape, about 35 minutes out of Cape Town. It is surrounded by the Simonsberg Mountains and is located on the banks of the Berg River. Val de Vie is a 1000-hectare estate divided up into various residential suburbs, including Pearl Valley with its Jack Nicklaus golf course. As can be imagined, the security team at Val de Vie has its work cut out for it in securing hundreds of homes and the families who live there. The perimeter of the estate is over 11 km long, which naturally poses an enormous risk and many opportunities for criminals. 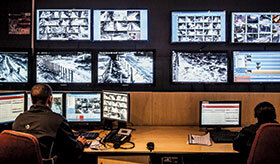 The estate currently has 94 smart analytical thermal cameras covering the perimeter, all linked back to the security control room as well as Val de Vie’s offsite monitoring service provider – Thorburn Security Solutions. De Jager says the estate has a well-trained team of outside perimeter tactical response officers who are armed and ready to attend to any attempted breach at a moment’s notice. Apart from being well trained, the team is equipped with the best available equipment as well as canine support. This team is further supported by unarmed response officers and guards on the inside who take care of the estate’s access requirements and other non-emergency situations. De Jager says that the tactical team has proved its worth in various situations, describing them as “having no sense of humour and being capable of dealing with anything that needs to be dealt with”. They played a leading role in support and affecting arrests in a recent incident on a neighbouring farm when the manager was attacked by eleven machete, brick and stick wielding individuals. The primary aim and idea, which has been successful for many years, is to harden the outside of the estate to the extent of making it as visibly impenetrable as possible, keeping intruders away from Val de Vie and having potential intruders rather searching for softer targets elsewhere. Of course, securing the estate requires more than only a modern perimeter security system and a well-trained team of tactical officers. De Jager says the estate’s security is intelligence-driven and his team regularly interacts with other people and groups in the neighbourhood, such as neighbourhood and farm watches. Everyone cooperates in an all-inclusive and integrated approach to ensure the whole environment stays as safe as possible. The estate also makes use of a range of Online Intelligence products to manage and analyse data to make informed security decisions. The estate’s access control is run via biometric technology which provides a more secure manner of controlling entry and adds to the intelligence in the form of an electronic occurrence book. The onsite guards, selected in cooperation with Thorburn, are also equipped with Instacom devices to allow them to work much smarter and if need arises, sound the alarm quickly and easily. Moreover, contractors must register and undergo fingerprint-based criminal record checks before being allowed onto the estate. Domestic staff and tenants are also checked to ensure maximum safety for all. Naturally, before the estate employs anyone, a strict vetting and background check is run and the prospective staff member may even be required to undergo a pre-polygraph test. Critical to the success of the security function at Val de Vie is the absolute support the team gets from the residents. The security sub-committee is chaired by a resident and reports to the Homeowners’ Association. The sub-committee meets once per month with all concerned parties and assesses the security situation to decide on how to go forward with various initiatives. There is no room for complacency and residents and visitors are constantly reminded that security begins at home and the less opportunities presented to opportunistic criminals, the less the odds are that they will become targets and victims. The hardening of the perimeter and the various security processes in place has paid dividends for residents as De Jager notes that there has been no penetration from outside for a number of years. Nevertheless, the security team can never rest as the criminal element is always planning something new and ready to test the defences again. With professional criminals constantly adapting their modus operandi, security has to follow suit and stay on top of its game or face the consequences. The security sub-committee has therefore begun a process to ensure an eventual rollout of the best possible task and site-specific legal drone technology. This is no small feat as it is an extremely costly and arduous exercise sometimes taking up to two years to ensure all the legal aspects are covered and Civil Aviation grants all permits, pilot’s licences and so forth. It is an exciting prospect for all concerned though and one to look forward to.